Is this my 200th post? I think it might be… Today I did a few things that I didn’t think I could manage in the kitchen. It’s been a while since I’ve tried to push myself to try to make things that I usually wouldn’t even think about, but today seemed like a good day for it. 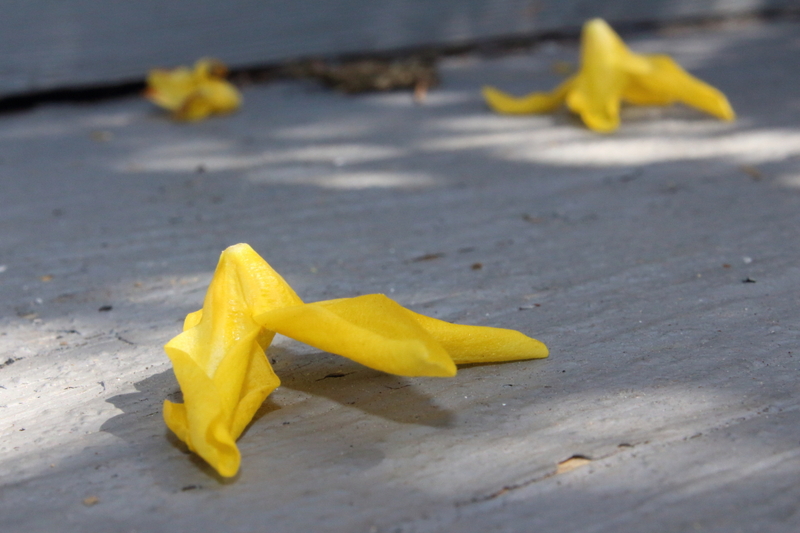 The sun was out, and I’d powered through all the things around the house I needed to attend to… Like taking pictures of fallen (forsythia) flowers on our front stairs… and set my DSLR to manual setting for the first time evah! 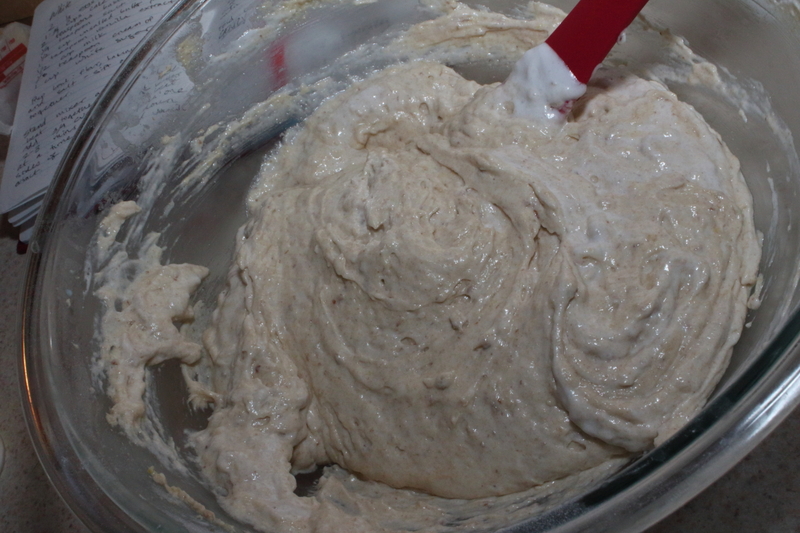 One of which, make ricotta cheese – but I’ll get to that tomorrow in another post. The second, more impressive to me, was realize that it was the Kentucky Derby today, and make some white cupcakes with mint julep frosting. There are a few things that I will tweak if I make this again, but overall, I liked it. I will skip right past the actual cupcake recipe, because aside from the fact that it’s made with separated eggs, it was total crap. I’ve made two cakes in the past week that I’ve whipped up eggs and folded them in, which is the only reason I’d mention it at all. I’m mostly unfamiliar with this way of cake making except for the 4 egg cake from the joy of cooking cookbook that is unbelievably popular in my family for birthday cakes. I’ve been all too keen to use flaxseed as a replacement for eggs when baking, and I also used some pastry flour (whole wheat) which I was not all too happy with the last time I used it for baking. I should’ve used some good old fashioned all purpose flour, but I wanted to “use up” the pastry flour. Bad call, in the end. 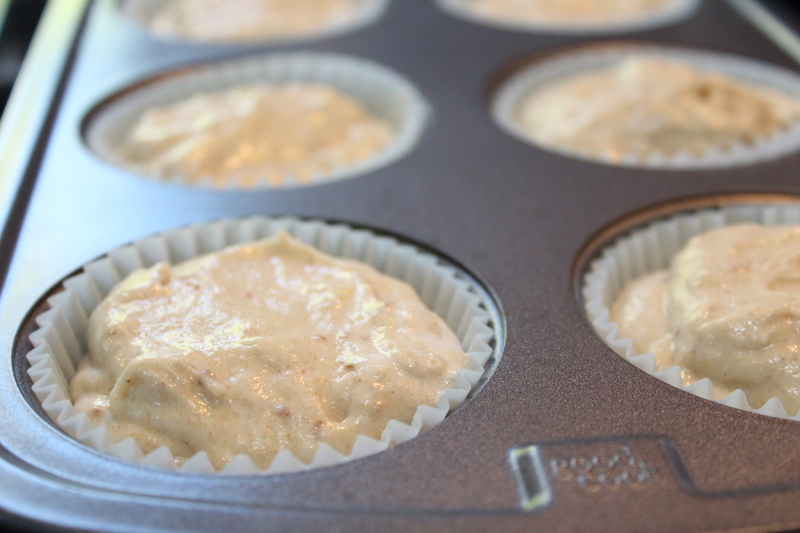 These bad larrys were all kinds of fluffy, to the point where they fell all over the place when pulled out of the muffin tin. Seriously a shame. 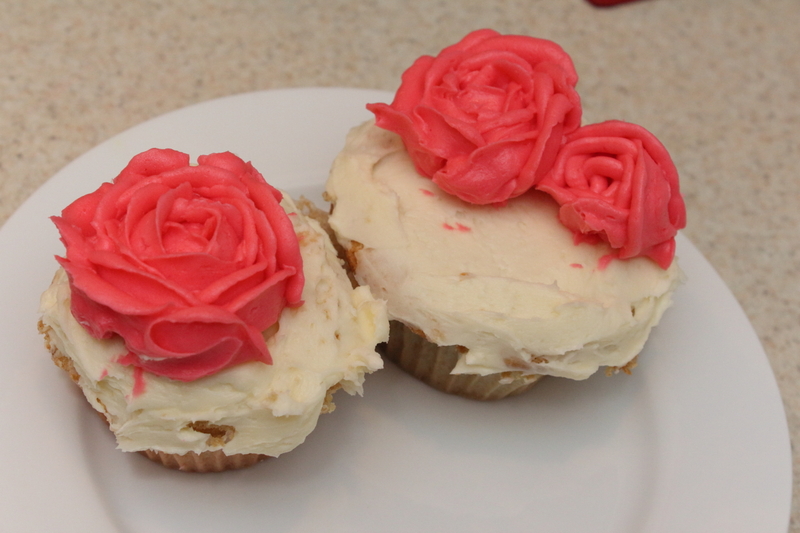 I figured that I’d save two of the least messed up ones to try my hand at frosting flowers, make some roses and knock a few out, and if I couldn’t hack it, I’d just dump um with the (literally) crumby cupcakes. OH. HOT. DAAAAUUUUM. I did it! I didn’t need a “frosting nail” or whatever it’s called either! I used an upside-down cup, and a butter knife instead of scissors. This was my first try at a rose, and it actually looks like one, a messy one, but still —- I am seriously impressed with myself. 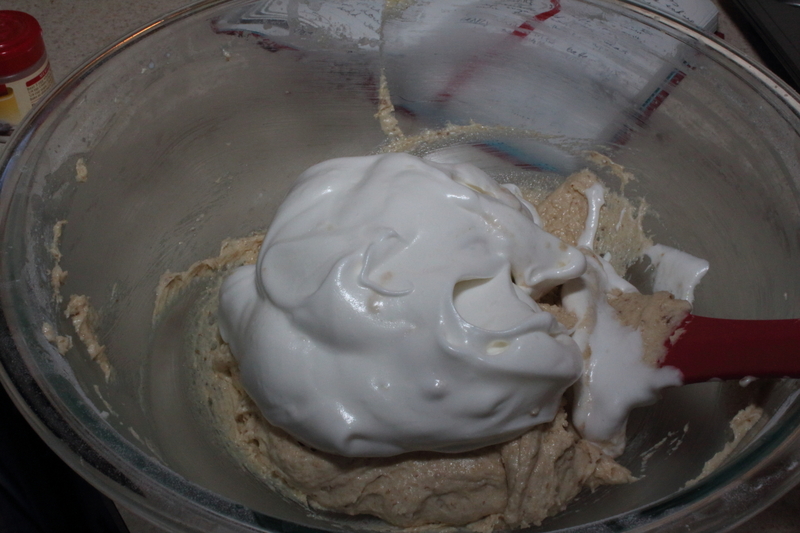 I’ve tried this once before and that was the messiest most awful looking glob of icing… Ugh. When your hands warm up the icing too much, this is what your flowers look like – a bit bubbly, or cartoony around the edges… I tossed the icing bag in the freezer for about 2 mins tops and I was able to make another good one before things warmed up too much again. Oh, yeah, son. That’s two roses right there. Two roses and a weird lookin smaller failure on the side. Ok, I’ll stop patting myself on the back and get down to the real business. How I made this icing. I would like to state for the record, though I know mint juleps are made with spearmint, I did use peppermint extract (dear southerners, please scrape yourself up off the floor?) but only a very little, a very very little. That still might not be ok, but I hope it makes it easier to read… and if I make it again, I plan to make it right, cause the two mints are distinctly different to my palate. In your stand mixer, or large bowl with hand mixer whisk butter together til it’s creamy, add sugar gradually until the butter starts to dry a little and ball up a bit. Add the bourbon, and then a few drops at a time of mint tasting as you go so you don’t overpower the flavor of the bourbon. You want 3 teaspoons of liquids total for this icing, so between the mint and bourbon, do what tastes good to you. I did almost all bourbon, with a few drops of mint, and it was still a little overwhelming. Your roses are beautiful and it’s brilliant to use the bottom of a glass rather than that nail, it’s so hard to hold and pipe at the same time. Lovely cupcakes! Thank you! I think if I had chilled the glass ever so slightly it could’ve helped a bit, but I’m always looking for a way to use the tools I already have in my kitchen, or house to make the things I want to try— success! I am amazed that rose looks like you have been piping for years. 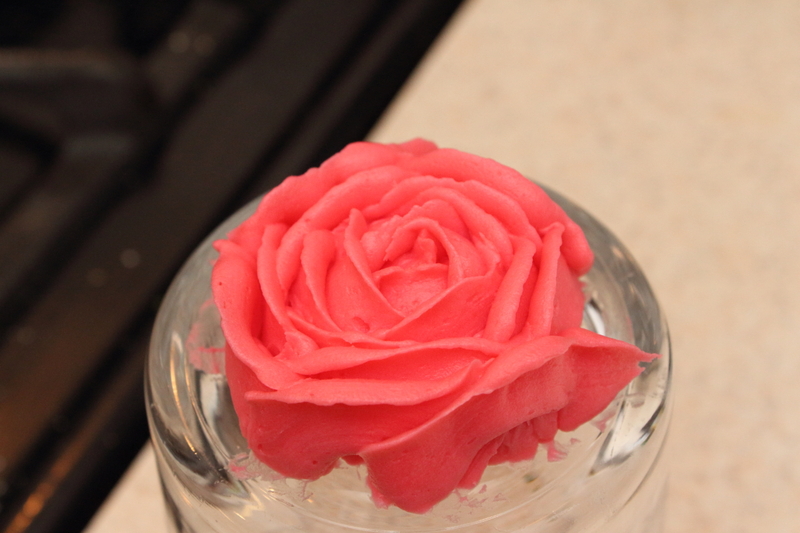 I am pretty good with fondant or plastique but piping roses eludes me. Congrats on making such a beautiful flower. You are seriously too kind. Nope. Just one total and utter failure of an attempt a few years ago. 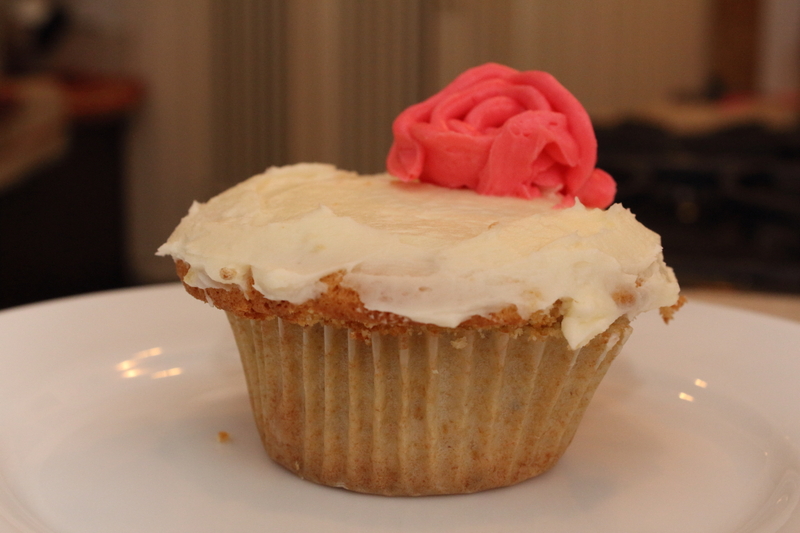 Hell, I couldn’t even really figure out how the whole piping bag and tip thing worked out til last year… Haha. I’d love to take a class for decorating, just so that if I try to experiment with fondant it doesn’t become an expensive ordeal. What is plastique? I don’t think I’ve ever even heard of that! Thank you! I hope to find a reason to get some more practice in soon!